The most common type of distraction for drivers under the age of 20 is using a cellphone. This may relate to making phone calls, texting or reading text messages or emails, or using social media sites like Facebook, Instagram, and Snapchat. When you’re on your phone, the risk of being involved in an accident is high. You might not have both hands on the wheel if you’re holding the handset, your focus won’t be on driving, and your eyes will be on the screen, rather than on the road. Texting while you drive is particularly dangerous. According to the National Highway Traffic Safety Administration, reading or sending a message involves you taking your eyes off the road for 5 seconds, which is sufficient time to drive the length of a football pitch. What are the consequences of distracted driving? Providing driver education classes in middle and high school: most students learn to drive outside of school, but offering sessions that are designed to highlight risks and encourage safe driving can be an incredibly useful addition to the curriculum. Organize events and campaigns that raise awareness of common causes of accidents among teens, including distracted driving, drink driving, and speeding. Schools in Williamson County launched a new program called Checkpoints after losing five students in crashes between November 2016 and January 2017. This involved engaging in one-to-one training sessions in order to obtain a parking permit for the school. The county also applied for a grant to provide schools with VR goggles to provide students with an accurate insight into what happens when you face potentially hazardous situations. Talk about the risks of distracted driving in classes and offer additional sessions for those who want to learn more. If students are aware of the risk of texting while they drive, they’ll be more likely to put their phone down when they take to the wheel. Use case studies and facts to back up your argument: many of us assume that car crashes are something that happens to other people, but the reality is that anybody can be involved in an accident. Using case studies and statistics and facts can help to clarify your argument and make teens more aware of the risks of taking their eyes off the road, even for a second. A CDC survey from 2015 suggests that over 40% of young people text or send emails while they drive. Discuss external organizations and arrange talks for young drivers: there are several organizations that specialize in promoting safe driving among teens, including End Distracted Driving and Impact Teen Drivers, and there’s also a host of online resources available. Education Lifeskills offers a great, interactive Distracted Driver course for teen drivers who find it difficult to stay focused when they’re driving. Limiting the use of cellphones in schools to get students used to being away from their phones. Why is distracted driving so common in teens? Today’s teenagers have grown up in a world that is very different due to the rise in popularity of the Internet, cellphones and social media. Research suggests that Americans check their phones up to 80 times per day, and the figure may be even higher among teens. Young people communicate by phone, they like to keep in touch with friends and family throughout the day, and many also feel obliged to keep tabs of their social media accounts. A poll conducted by the AAA suggests that 94% of teen drivers are aware of the potential risks of texting while driving, but over a third still do it. Teen drivers are four times more likely to be involved in crashes than adults when texting or talking on a cell phone. Part of the problem is that teens are so used to having their phones with them all the time that they can’t resist the temptation to make a call, scan their Instagram feed, or send a text even though they’re driving. 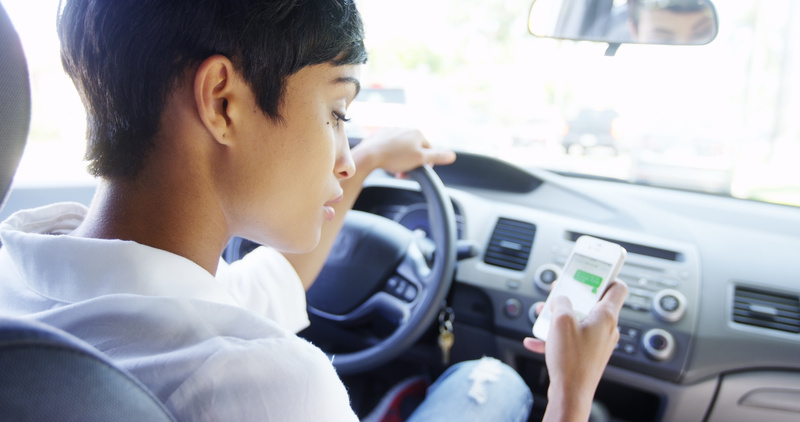 The aims of campaigns and distracted driving courses should be to educate young drivers about the consequences of distracted driving, but also to highlight the fact that you don’t have to be connected to your phone 24-hours-a-day. If a call is urgent, it’s much safer to pull over or to use an in-car hands-free system. Education Lifeskills’ course is not a traffic program, but rather a training module that emphasizes the importance of a safety-first approach to driving. Distracted driving is the most common cause of car accidents among young drivers. To tackle the crisis, teenage drivers, parents, educators, nonprofits, and external training providers can work together to raise awareness of the dangers of distracted driving and make our roads a safer place for everyone.